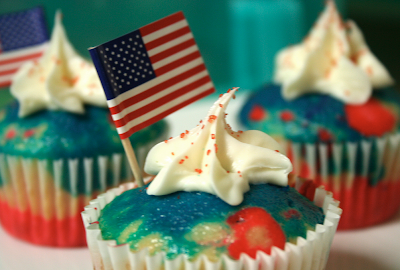 These festive cupcakes are great for 4th of July... make sure to use transparent (white) cupcake sleeves! 1. Separate the batter into three equal portions. Leave one portion white. Add blue food coloring to one portion until it is desired color. Add red food coloring to one portion until it is desired color. I used these food coloring gels from Williams Sonoma which gave a really beautiful vibrant color to the batter. 2.Spread a heaping tablespoon of the blue color batter into the bottom of a cupcake liner in a cupcake pan. Spoon a heaping tablespoon of the white batter on top of the blue batter. It makes 24 cupcakes. Bake at 350 degrees for about 20-25 minutes or until a wooden pick inserted in the middle comes out clean. Allow to cool and top with frosting and decorate if desired. Heat oven to 350 degrees. Line two cupcake pans with cupcake liners. Beat butter, sugar, baking powder, and salt in a large bowl with a mixer on high speed for one minute or until fluffy. Add eggs; beat two minutes. Reduce speed to low and beat in milk and vanilla (batter may look curdled). Then beat in flour until just blended. If coloring batter, separate into three bowls. Keep one white. Add blue food coloring to one and red food coloring to the other until batter becomes desired shade. Layer one heaping tablespoon of blue batter in the bottom of cupcake liner, spread to coat bottom. Top with one heaping tablespoon of white batter. Gently spread to cover blue. Top white with one heaping tablespoon of red. Gently spread to cover white. You can also place colors side by side, as above. Bake for 20-25 minutes or until a wooden pick inserted in the middle comes out clean. Allow to cool. Frost and decorate. In a large bowl, with a mixer on low speed, combine confectioners sugar, butter, milk, and vanilla. Beat at medium speed for one to two minutes until creamy. If desired, add more milk until frosting is spreading consistency. Make sure to take photos of your cupcakes and post them on our facebook wall!